I have always thought of this as one of the “classier” tea places in town having heard of its reputation and its star-studded clientele. 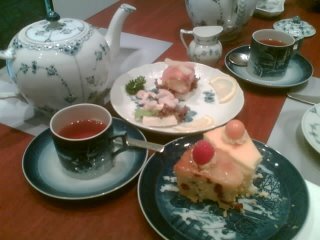 The tea was good, no doubt, – we had a set that comprised open face sandwiches and very excellent cakes: cranberry almond and New York cheese cake. And gorgeous tea. However when served in chipped China on place settings that were glued to the table – it somewhat takes the magic away.